Over Forty Acres of Fruity Family Fun! Over 40 Acres of Fruity Family Fun! Homemade Donuts & Fresh Fruit Smoothies! Lot's of family fun activities - Live Music and much more! Always check here or our Facebook updates for current picking conditions and availability. Our 2018 Harvest Season has come to an end. We would like to Thank everyone who visited us and created memories this season. Also a special thank you to all our wonderful staff members. None of this would be possible without your hard & excellent work. Together everyone made 2018 a special season! Thank you and we look forward to seeing you all at the beginning of the 2019 season! Fruit is sold by the pound(price subject to change, price effective 2018). All amenities (restroom facilities, shaded picnic areas, shuttle rides, live music etc.) are included, no admission charges or minimum purchases. Free Live Music & Entertainment on Weekends and some Weekdays. Our Apple Picking Season starts in Mid August and continues into November. Apples are sold by the pound & apple bags are provided. We are a multi-generational family owned and operated farm, dedicated to growing quality and environmentally conscious fruits. We want our land to be farmed for many more generations, that’s why we are focused on long term stewardship of the land by growing in a sustainable manner. We want our local farm to sustain itself by working with nature and the environment. Our family strives to grow the healthiest fruit possible for your family to enjoy. We follow a strict Integrated Pest Management (IPM) system, IPM is an environmentally friendly, common sense approach for controlling pests. All materials used are biodegradable, both synthetic & organic materials and are used as last step of IPM. Preserving and enhancing the health of the soil is key for sustainable farming. Retaining and improving natural healthy soil is key to for maintaining healthy fruit trees and plants. The soil is alive and needs the proper amount of organic matter. Organic matter represents a small portion of the soil but is the most important dominates the whole health of the plant. The organic matter is where the beneficial microbes are abundant. Many minerals are already in the soil but not in a form that the plants are able to access. Enhancing the natural process of the soil will increase microbial actions converting the organic nitrogen & organic phosphorus into a form that the plant will utilize. Healthy soil will increase the amount of nutrients readily available and will result in an improved soil tilth. Soil, tissue and fruit samples are conducted throughout the year to monitor the 17 essential nutrients required for plant growth. We use NO petroleum based granular synthetic fertilizer. Petroleum based granular synthetic fertilizer can harm the organic matter. We use NO systemic herbicides on our farm. The use of such materials like “Round Up” was discontinued several years ago over the concerns of our soil health. The IPM approach can be applied to both agricultural and non-agricultural settings, such as the home, garden, and workplace. IPM takes advantage of all appropriate pest management options including, but not limited to, the judicious use of pesticides. “Integrated pest management (IPM) is a sound, sensible approach to dealing with pests—insects, plant diseases, weeds, and more—with methods that protect human health and the environment while saving money. IPM is integrated because it brings together, or integrates, a range of biological, organic, cultural, mechanical, and chemical options for pest problems. IPM is about more than just bugs—it’s also about fungi and mildew, bacteria, viruses, weeds, and wildlife, all of which can be pests if they’re in the wrong place at the wrong time. Why does my GPS want me to travel down a dirt road? Do Not Follow you GPS down Norton Road. Continue south on Route 11 (until you see our U-Pick sign) and take a Left onto Pickerel Pond Road. Please read our How We Grow page for how we farm in a sustainable manner. How do I keep or store the fruit I just picked? Blueberries: Our fresh blueberries will keep 3 weeks refrigerated or 1 year frozen. Berries will keep a few days or more at room temperature and should be chilled as soon as possible. For best results do not wash the berries prior to storing (fridge or freezer). Washing is not necessary but if you like to, only wash berries prior to consuming. Handle the berries as little as possible. Both washing and over handling will remove the natural film on the berry called the “bloom”. The bloom is necessary for longer shelf life. Always allow air to circulate while refrigerated, never store in a sealed container or bag in the fridge. Remove berries from refrigerator one to two hours before serving. Berries are at their fullest flavor at room temperature. When freezing store in a sealed container or freezer bag. Dry unwashed berries will freeze individually (like little marbles) and will pour out easily. For most recipes thawing the berries is not needed. Summer Hours depend on ripe fruit available, when we have ripe fruit to pick we will be open. All picking hours and days are posted on this site on the Picking Today page and on our Facebook page, also on our phone message (207)793-4749. We do close for ripening and for inclement weather when needed. Please check the Picking Today page or call before you venture out. Fall Hours are Tuesday-Sunday 9am-5pm unless otherwise posted. Always check for fruit availability. There is No Admission charges and no cost for parking. Fruit is sold by the pound, no minimum or maximum amount. 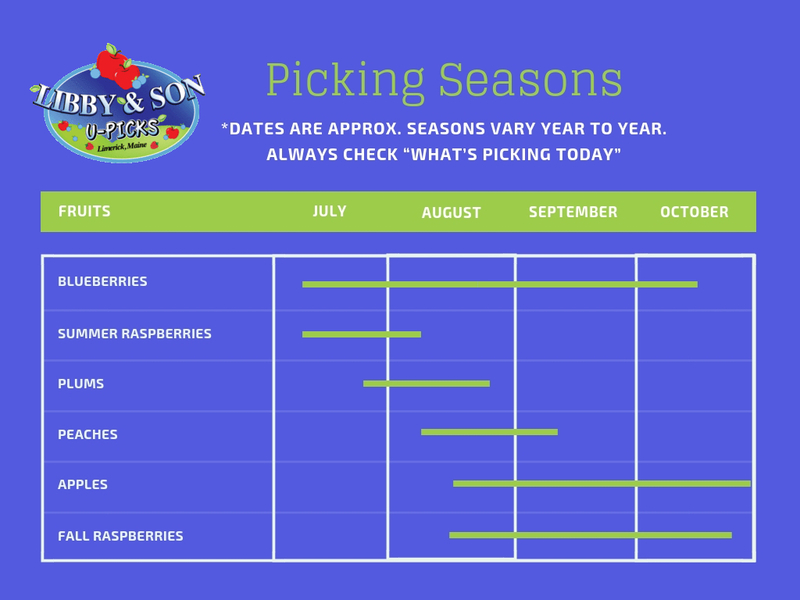 Please click on the What’s Picking Today for fruit availability and prices. Cash or Check. We also have an ATM for your convenience. Yes! We offer educational tours for all ages and group sizes during the Fall Harvest. All types of tours are welcome including Senior Groups, Bus Tours etc. We are also available (November-April) for at school, corporate, conference presentations. Please call for more information and reservations. We are sorry but keeping with good agricultural practices and for liability reasons pets are not allowed. This does not apply to service dogs. Do I need to bring my own Container? No, you do not have to. You are welcome to bring your own container, for berries, which we will mark for the weight (that way you will not be charged the weight of the container). For Blueberries we have an excellent container for the purchase of a $1.00 that will hold any amount to 12lbs. For Apples we have special apple bags (1/2 b bushel ≈20lbs) that are provided at no additional cost. For Raspberries we have pint and quart berry boxes for 25¢ each. For Peaches we have peck bags or 4qt trays ≈10lbs that are provide at no additional cost. Are the berries measured by the Quart or by the Pound? Maine weather can change quickly and is unpredictable. It is good to come prepared i.e.. jacket, sweatshirt, hat, shorts, raingear sunscreen, bug spray etc. Cold beverages are available for purchase. We have a picnic area for to enjoy your lunch. Either pack a lunch or enjoy hot food on certain days (most weekends but call to make sure). We have multi room restroom facilities including a handicapped accessible restroom all with hot and cold running water (no out houses!). Our check in/out building and pavilion are heated for those crisp fall apple picking days. Shuttle rides are available to take guest over the entire picking fields. A shaded picnic area is available. How many Plants and Trees do you have? We currently have 12 varieties/10,000 Blueberry plants on over 18 acres and are still planting more. We also have 18 varieties/5,500 Apple Trees , 7 varieties of Peaches and 4 varieties of Plums. We have 7 varieties/2,000 Raspberry plants and we are planting more next year. In total we have about 40 acres in production each year. Can we find a Hiking Trail close by? YES, within 1/2 mile of our farm on Sawyer Mt Rd. there is a new parking lot and trail to the summit. This new trail connects to the existing trail and parking lot located on RT. 117 Maps will be available at our farm. For more information on Sawyer Mt. visit Francis Small Heritage Trust, Inc.
Do you have Strawberries to pick? No, I am sorry we do not grow strawberries. However we recommend visiting Doles Orchard, they have pick your own strawberries in season. Doles is located in Limington, 6 miles away from us. Are there any local places to spend a night (or a week!)? Yes, there are hundreds of places to stay the night in Southern Maine. Accommodations from ocean front to lake front to mountain views. From 5 star resorts to motels, from bed & breakfast Inn’s to campsites. The Jeremiah Mason House Bed & Breakfast is located in the Limerick Village. Follow our U-Pick signs on Route 11 in Limerick for best results. From the Portland area take Route 25 west, in Limington turn Left on Route 11 south. Continue south on Rte 11 into Limerick and turn right onto Pickerel Pond Road and follow our U-Pick signs. Avoid the following roads, they are not shortcuts, Norton Road, Coffin Hill Road and Staples Road.